One of the biggest battles we face concerns the way we use words. One of the most glaring examples is the word ‘tolerance’. Not long ago, this meant ‘bearing or putting up with someone or something not especially liked’. However, now the word has been redefined to ‘all values, all beliefs, all lifestyles, all truth claims are equal’.1 Denying this makes a person ‘intolerant’, and thus worthy of contempt. Where does this leave Christians? Jesus said, ‘I am the way and the truth and the life. No one comes to the Father except through me’ (John 14:6). And the Apostle Peter said, ‘It is by the name of Jesus Christ of Nazareth, whom you crucified but whom God raised from the dead … Salvation is found in no one else, for there is no other name under heaven given to men by which we must be saved’ (Acts 4:10–12). The new definition of ‘tolerance’ makes the Christian claims to exclusivity ‘intolerant’, which supposedly justifies much of the anti-Christianity in the media and the education system. But this argument is glaringly illogical and self-refuting. That is, if these ‘tolerance’ advocates reject Christianity, then they are not treating this belief as ‘equal’. So, in practice, to paraphrase George Orwell in Animal Farm, all beliefs are equal, but some beliefs are more equal than others. The result is extreme intolerance towards Christianity from people who talk so much about tolerating all views. In short, they are intolerant of intolerance, so logically they should be intolerant of themselves! Even within the church, organizations such as CMI are called ‘intolerant’ for believing that the days of Genesis 1 were normal days. Conversely, many Bible colleges claim to tolerate all views about Genesis and teach them to their students. But what about the view that the grammar of Genesis teaches, unambiguously, that the days were 24-hour days and all other views are wrong?2 No, that would be intolerant! We should be ready to expose such ‘suicide arguments’,3 as well as anti-Christian arguments where an evolutionary critic has at least as much of a problem. 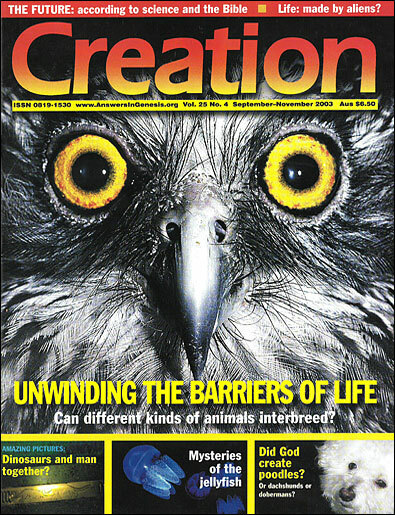 This issue of Creation deals with the ‘distant starlight’ problem by showing that big-bangers have a light-travel problem of their own (see article on pages 48–49). ‘On any criteria, Jesus Christ is one of the great figures of history. More than that, his claims to be the Son of God, who has made God known and taken away the sins of the world, bear up under the closest scrutiny. This is our conviction, and we urge every student to thoroughly investigate this unique figure, Jesus’. But contrast this with the former head of the HGP, James Watson, and his co-discoverer of the DNA double-helix structure, Francis Crick. They both used the 50th anniversary of their discovery to push their atheistic views. The media had no objection to them mixing their religion with their science and politics! Crick is so desperate to cling to his atheistic ‘faith’ that he even resorts to the idea (exposed as futile on pp. 54–55) that earth life was brought here by aliens; anything to avoid God. We trust that this magazine will help you to answer common anti-Christian fallacies, and equip you to help others do the same. McDowell, J. and Hostetler, B., The New Tolerance: How a cultural movement threatens to destroy you, your faith, and your children, Tyndale House, USA, 1998. See Sarfati, J., The numbering pattern of Genesis: does it mean the days are non-literal? Journal of Creation 17(2):60–61, 2003. Koukl, G., Arguments that Commit Suicide, Stand to Reason, July/August 2001. Matthews, M., Dunce cap for creationists? Texas Tech prof won’t recommend creationists, 14 January 2003. Contractor, A., Noonan, G. and Burke, K., God’s quad, Sydney Morning Herald, p. 37, 16–17 November 2002. Beardsley, T., Where science and religion meet, Scientific American 278(2):18–20, February 1998. Collins, F., The Human Genome Project: Tool of atheistic reductionism or embodiment of the Christian mandate to heal? 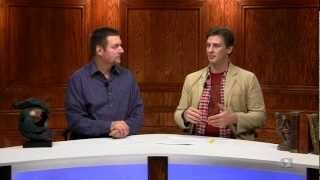 Science and Christian Belief 11(2):99–111, 1999; see p. 110. Harvesting real fruit, Creation 25(2):19–21, 2003.